This blog chronicles the adventures of Rick Ector, an urban Firearms Instructor in the most violent city in the world - Detroit, Michigan. Info on Personal Protection, Firearm Safety, Concealed Pistol License CPL, Concealed Carry Weapons CCW, Detroit CCW Class, and Self-Defense. As seen on AP, UPI, NRAnews' "Cam and Co. Show," Gun Digest Magazine, Tactical-Life, The Urban Shooter Podcast, Firearms Truth, The Politics Daily, Fox News Detroit's - "Channel 2 News" and "Let It Rip." Buy A Black LAID T- Shirt Now! On Friday morning on the date of December 21rst, I made my first media appearance on the "Essentially Sabrina Show" with host Dr. Sabrina Jackson at 1:00am. While on the show, we discussed everything you ever wanted to know about personal protection. Please view the video to check out the show. If you are curious about learning more about guns and personal protection, you do not want to miss this show. Need a Gun Rights speaker for your next gathering? Call me: 313.733.7404! 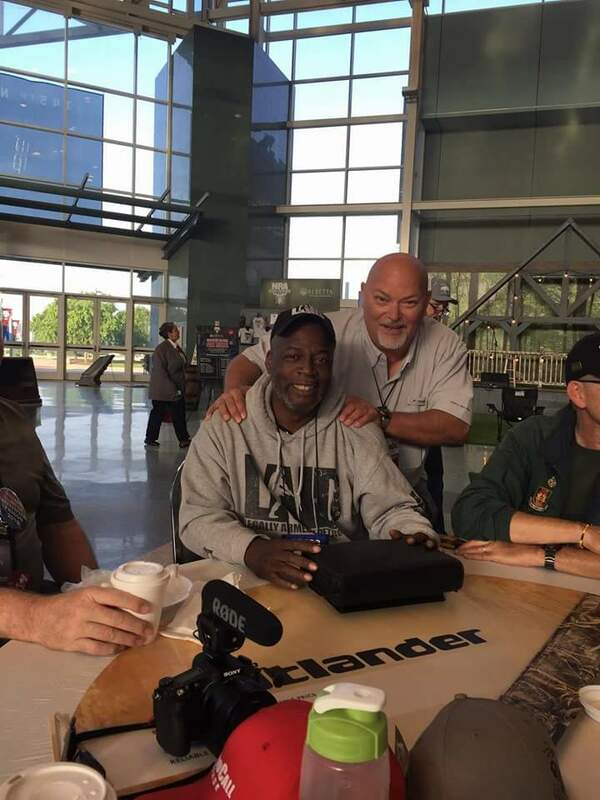 Rick Ector is a National Rifle Association credentialed Firearms Trainer, who provides Michigan CCW Class training in Detroit for students at his firearms school - Rick's Firearm Academy of Detroit. Ector is a recognized expert in firearm safety and has been featured extensively in the national and local media: Associated Press, UPI, Fox news, New York Times, USA Today, Bearing Arms, NRAnews, Guns Digest, Tactical-Life, The Truth About Guns, The Politics Daily, Fox News Detroit, The Detroit News, The Detroit Examiner, WJLB, WGPR, and the UrbanShooterPodcast. If this information was useful for you, would you please make a small recurring donation to support this site? PSA: If you carry a firearm for self-defense, you need to protect yourself by having a membership in a Firearm Legal Program. To see the plan that I belong to, click this link now! Be Trained By The Best! If you have a desire to qualify for a Concealed Pistol License (CPL), so that you will become safe, register for our next class. Everyone claims to be the best. I am going to show you why we are the best. Our classroom sizes are limited to ensure a proper learning environment. You will be comfortable asking questions that are most pertinent to your situation. We understand that being stuffed in a sardine can with 50 other students leaves much to be desired. Our legal module is taught by a credible practicing criminal defense attorney. The legal module will NOT consist of an attorney - who never actually practiced law - lecturing on your duties, rights, and responsibilities under the law on a DVD. Your safety and freedom deserve much better. Other providers, if they teach the law at all, only offer up their unprofessional and untested opinions. Our attorney is also a regular subject matter expert featured on the news and local talk shows. I daily receive phone calls from students who took the $50 classes and short-changed themselves. The irony is that is that instead of calling their original trainer, they end up calling me. By this time, all I can do is refer them to competent counsel and hope that the amount of trouble they get into is minimized. You have a choice: pay just a little more now for a superior class or pay a ton more later. We provide one-on-one shooting supervision in the shooting booth. We understand that you need expert instruction on the safe operation of a pistol from a whisper away. Unlike the others, we do not have one instructor who watches five students on the range at the same time. We are right there with you each and every step along the way to ensure that you are safe while learning. Finally, our Chief Instructor actually teaches the class. He does not rely upon the playing of out-of-date and boring DVDs as a substitute for quality and up-to-date instruction. Our training is a 100 percent live and entertaining presentation which ensure that you fully grasp and understand the material well after you leave the classroom. My students see for themselves how fast the GroupOn classes are over before we reach the half-way point of our class. Our Chief instructor has been training citizens, such as yourself, for over ten years with a 100 percent safety record. We are especially adept at training first-time shooters, women, and seniors. We are not fly-by-night operators. We have seen many training providers come and go over the last decade. Only quality Instructors have staying power. We are here for the long haul. So, if you ever have a need for follow-up, you know that you can find us - even if it is five years later. If you want the best instruction, you have to be taught by the best. You deserve it, your family deserves, and your safety at home and out in the streets requires it. Don't be penny-wise and pound foolish with your safety. Go with the best. Me. When my students call me, they are referring family members and friends to take our class. When graduates from other training classes call me, they were failed by their instructors and need serious legal help. Get it done right the first time. Range expenses will be incurred at the range to handle gun rental, range time, ammunition costs, and a fee for a target. The estimated fee is $35. Chief Firearm Instructor Rick Ector is a recognized expert in firearm safety and has been featured extensively in the national and local media: New York Times, Associated Press, UPI, USA Today, Fox News, NRAnews, Wall Street Journal, The Guardian, National Public Radio, "Let It Rip," the Detroit Metro Times, Guns Digest, Tactical-Life, The Truth About Guns, The Politics Daily, Fox News Detroit, The Detroit News, and the Detroit Free Press. Ector has the following NRA Certifications: Training Counselor, Chief Range Safety Officer, Home Firearm Safety, Pistol, Shotgun, Rifle, Personal Protection I, Personal Protection II, Shotgun Shell Reloading, and Metallic Cartridge Case Reloading. - Ector was featured in a new nationally broadcast 9-part NRA series entitled "The DL with Dana Loesch" in early 2017. - Ector was featured as a Gun Rights Advocate in the Comedy Central Special entitled "Jordan Klepper Solves Guns" in mid-2017. - Ector was named as a 2016 "Defender of Liberty" by the Second Amendment Foundation at the Gun Rights Policy Conference (GRPC) in Tampa, FL. - Ector was named the 2014 MCRGO Guns Rights Advocate of the Year. - Ector was named the Keynote Speaker of the 2014 Michigan Second Amendment March. - You don't want a 2 hour live lecture from a respected and practicing criminal defense attorney on the law. You will learn the law! - You are comfortable with up to 60 sixty students stuffed into a classroom. In my class you will be comfortable. - You don't want to be one-on-one with a Firearm Instructor in the shooting booth with you. - You are not willing to spend at least 8 hours in class to get the best possible start as a CPL-holder. 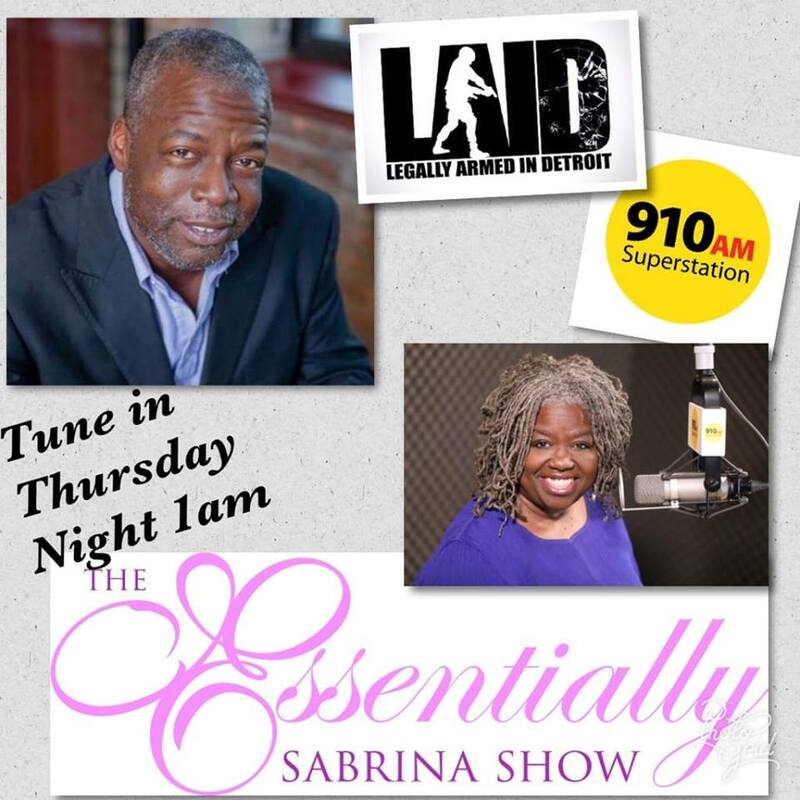 I will be making a media appearance on the "Essentially Sabrina Show" with host Dr. Sabrina Jackson on this upcoming Thursday night (Friday morning) at 1:00am. We will be discussing everything you ever wanted to know about personal protection. I look forward to it, as it should be a lot of fun. If you are going to be awake, listen in to the show! 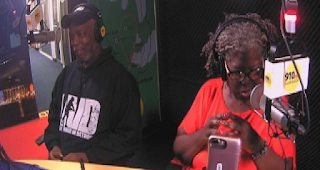 If you find the discussion engaging, take the next step by calling in to the show and ask me a question while I am live on the air! Earlier today, I had the honor of being interviewed over four seqments of the "Lock n Load" show with host Bill Frady. It was an action packed hour of conversation and commentary on a diverse body of topics: Trevor Noah's televised hissy fit on the Second Amendment (guns) not being for black people, Red Flag Laws, Philando Castille, Emantic Bradford, Wayne County (MI) "Bullet Bill," and "Legally Armed In Detroit (LAID)" Firearm Training. I don't know if I have ever addressed so many topics in one appearance before today! Nothing like a bonus! Check out the show on this link. 2014 CPL Class Special Deal! We provide FREE shooting lessons for women by selling our challenge coins to our followers who believe in our mission. Help us empower women with the skills necessary to protect themselves and their families from violent predators. Buy one now! FREE E-Book Offer! $30 Value! More Info | Get It FREE! How Much Stuff Are You Lugging Around Every Day (EDC)? Michigan CPL-Holders Can Open Carry In "Pistol-FREE Zones"
How Many Keys Do You Need To Carry? FAQ: Do you have any recommendations for rifle and hand gun ranges in Ann Arbor/ Ypsilanti area? Don't Take The "Date Bait"
If You Hear Gunfire - Get Down! Is Your Vehicle Betraying You? Harden Children Against Pedophiles With "Code Words"
Stay Out Of "Pistol-FREE Zones"
How Long Does It Take To Enter Your Residence? Keep up-to-date on this blog's content via our FREE Smart-Phone app! It runs on the following mobile platforms: Android, IPad, Symbian, and BlackBerry. Subscribe now to our CCW/CPL Class E-List and be automatically reminded by email whenever we arrange another class. You can cancel from the system at any time. We hate spam! We will never ever sell or rent your email address to any other entity for any purpose. Official Blog of Rick's Firearm Academy of Detroit! Register For Our Next CCW Class! Visit our Official Web Site! Buy CCW Class Gift Certificate! View Over 100 Video Testimonials! FREE Shooting Lesson For Ladies! FREE Brochure Of Our Services! FAQ: You have any recommendations for rifle and hand gun ranges in Ann Arbor/ Ypsilanti area? Personal Protection Tip: How Long Does It Take To Enter Your Residence? FAQ: How Can I Check On The Status Of My Michigan CPL Application Submission? FAQ: Do You Believe A Dog Will Prevent Robbers From Breaking Into Your Home? FAQ: Is It Acceptable For A Disabled Person To Carry A Firearm For Personal Protection? FAQ: Are CPL-Holders Required To Possess Their Pistol Registrations When Carrying Their Guns? FAQ: What Handgun Caliber Size Do You Suggest For New Women Shooters? FAQ: Is It Unlawful To Carry A Handgun In A School (K-12)? How Much Residency Is Needed Before A Person Can Apply For A Michigan Concealed Pistol License? FAQ: Can A Business Owner Ban Open Carry On His Property? FAQ: Is It Unlawful For Me To Conceal Carry My Firearm While In The Presence Of A Felon? FAQ: Is It Legal For My Friend To Carry A Handgun In My Vehicle If I Have A CPL? FAQ: Can You Carry A Handgun In A Bank Or A Credit Union? FAQ: If you get a CPL, can you still legally open carry in Michigan? FAQ: Could Failing To Register To Handgun Within 10 Days Have A Negative Effect On A Person's CPL? FAQ: At What Distance Should Laser Sights Be Calibrated? FAQ: Can I Conceal Carry At "The Fillmore" In Detroit? FAQ: How Much Does It Cost To Renew A CPL? FAQ: Can I Leave My Firearm In My Vehicle In My Employer's Parking Lot? FAQ: Can I Conceal Carry Into A Public Library With A CPL? FAQ: Is It Legal To Walk On A School's Outdoor Track While Carrying A Firearm? FAQ: Is It A Crime To Conceal Carry In A Private Business With A "No Guns Allowed" Sign? FAQ: In Michigan, can you conceal carry in a restaurant that serves alcohol? FAQ: What is the allowable blood alcohol content (BAC) while carrying.a firearm? FAQ: Where Do I Submit My Completed CPL Application? FAQ: Can A Person With An Expunged Felony Qualify For A Michigan CPL? FAQ: Where can I purchase .45 rounds for target practice? FAQ: Are Movie Theaters Pistol-FREE Zones In Michigan? FAQ: Will I get into trouble if my lawfully carried pistol "prints" through my clothing? FAQ: Do You Have Any Advice For Traveling Out Of State With A Firearm? FAQ: While Open Carrying Am I Still Required To Disclose That I Have A CPL? FAQ: At What Age Can A Person Be Issued A Permit To Purchase A Handgun in Michigan? FAQ: What is the legal and proper way to transport a long gun in Michigan? FAQ: How early in advance should I apply for a Michigan Concealed Pistol License Renewal? FAQ: How Can I Contest A CPL Rejection Letter That Didn't Specify A Disqualifying Reason? FAQ: Does Your Handgun Have to Either Be Completely Open Carried or Completely Concealed? FAQ: How Long Does It Take For My CPL Application To Be Processed? FAQ: Can You Legally Shoot A Car Thief In Michigan? FAQ: Can You Legally Carry A Handgun Into A US Post Office If You Have A Michigan Concealed Pistol License? FAQ: How Many Guns Can You Carry With A CPL? FAQ: How Long Does It Take To Get Approved For A Michigan CCW/CPL? FAQ: How To Renew A Michigan Concealed Pistol License (CCW/CPL)? FAQ: What Is The Difference Between A Michigan CCW And A Michigan CPL? FAQ: How Old Do You Have To Be To Get A CCW In Michigan? Cast of "Lethal Weapon III"
Site Video Index - Watch Now! [Video] What is the Relevance of Teaching Cover in a CPL Class? [Video] Do You Know The Difference Between Cover and Concealment? [Video] What Are The Two Most Dangerous Places To Be In The City? [Video] When Is The Only Time You Should Be Unaware Of Your Surroundings? [Video] What Does It Mean To Be Actively Aware? [Video] Why Is It Important To Regularly Clean And Maintain Your Handgun? [Video] What Is The Difference Between Defensive Accuracy And Marksmanship? [Video] Personal Protection Firearm On Nightstand: Loaded Or Unloaded? [Video] Don't Ever Get Into A Predator's Trunk! [Video] What Is Michigan's Definition Of A Firearm? [Video] Can You Shoot A Predator? [Video] What Is A Squib Load? [Video] Robbery Response: Fight, Run, or Comply? [Video] Why Do Handgun Barrels Have Grooves and Lands? Help us introduce ladies to the safe usage of firearms! Buy CCW/CPL Training Class Gift Certificates! Give the gift of personal protection for your loved ones! Each certificate entitles a person of your choosing to be enrolled in one of our firearm safety classes with the class tuition paid in full. Our training class satisfies the state of Michigan's educational and shooting requirements for a Concealed Pistol License (CPL). The gift certificates are redeemable for any CPL Class that we conduct within 18 months from the date of purchase. Networked Blogs - Follow Me! Are All Detroit Police Officers Aware of the Fact That Open Carry is Legal in Michigan? How To Insure Your Guns Up To $1,000 For Only $35/yr Or Less! Is The National Rifle Association (NRA) An Organization For Black People? Did DPD Northeast District Police Officers Turn Their Backs On The Citizens of Detroit? Are Metro-Detroit Judges Compromising Public Safety? Can You Legally Shoot A Car Thief In Michigan? Can You Legally Carry A Handgun Into A US Post Office If You Have A Michigan Concealed Pistol License? Detroit Police Acknowledge Open Carry At This Year's "Country Hoe Down"
Should Michigan County Gun Boards Be Disbanded As Unnecessary Relics Of Our State's Racist Past? Detroit Police Is Speaking Frankly About Crime - Are You Listening? Will Rev. Jerome Warfield Resign From The Detroit Board of Police Commissioners Tomorrow? What Should DPD Do With The Guns That It Buys From Citizens? Whose Job Is It To Keep Metro-Detroit Citizens Safe From Violent Crime? Is The IHOP In Detroit On Jefferson Avenue In Violation Of Corporate Policy? Are You Legally Armed But Totally Clueless About Michigan Firearm Law? Does A Misdemeanor Domestic Violence Conviction Justify A Gun Ban? Are Michigan Police Departments Violating One Of Your Rights Granted By PA 381 of 2000? Can Statistics Show DPD How To Allocate Its Resources? What Do Firearms Instructors Really Sell? Why Pay A Crook For The Privilege Of Breaking The Law? Exactly How Many Guns Does It Take To Make An Arsenal? What Does This Fourth Of July Means To Me? Can You Shoot A Child? Are Early Michigan Prison Release Programs Endangering Public Safety? I do most of my blogging and article writing in coffee shops because there are too many distractions at home. Every so often, they expect me to buy a cup of joe to justify my presence. Help me get more stuff written by buying me a cup of coffee! Michigan Concealed Pistol License Class: How Many Guns Can You Carry? Michigan Concealed Pistol License: Future TASER Option? Follow Me Now & Never Miss An Update! As a NRA Membership Recruiter, I am authorized to offer you a discounted membership for one year. Also, be advised that when join the NRA you will receive a $1,000 insurance policy - at no additional cost - covering your firearms against loss. A one year membership costs $35. Use my recruiter link and save $10. Your dues for this year is only $25! There's no reason not to join. Twitter Updates - Follow Me! "I recently attended Rick's class so that I could obtain my Michigan CPL. He is extremely professional, yet relaxed, and kept the class interesting, exciting, and informative. He covered a lot of information regarding the laws, how to handle situations should they arise, gun/ammunition types, gun selection, and most importantly safety. I would recommend this class to anyone from the the most seasoned of gun owners to the novice who has never even held a gun before. Rick showed us proper shooting stances and techniques and the best ways to optimize accuracy. He also will stop right away to answer any questions that may come up. For all of these reasons and more, Rick will be my first stop for all of my self defense needs. Thanks Rick!!!" "If you are even thinking about carrying a concealed weapon for personal protection, Rick's class is the absolute first step you need to take in preparing. You will learn everything you need to know to protect yourself -- not only with your concealed pistol, but also from the authorities if you should ever have the unfortunate circumstance to use your weapon in self-defense. You will get the necessary legal information to know how to respond to the police and what to say and what not to say to the 911 operator if you should have to make that call. Rick doesn't take shortcuts. Rick and his associates take the necessary time to show you the proper way to clear and handle a firearm. Take the class, you will be glad you did! Thanks for all you are doing! Regards,"
"Hey Rick! I want to thank you for providing such a vital service to the community. 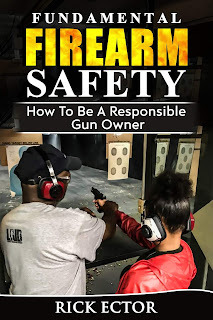 Everyone who cares about their safety and their freedom needs to be educated on how best to secure both, and I can't think of anyone better equipped to teach them than you. Your class was very informative, and as the instructor you were very knowledgeable on every aspect of gun ownership and usage and very patient with the many questions I asked- and had a ready answer for all of them! I would certainly - and have already- suggest anybody looking for a CPL go to you first." "Rick, Thanks for providing me this opportunity, it was very informative and I would definitely recommend your class to others. Take care!" "As an attorney and just as a regular citizen of Michigan, I cannot say enough good things about Rick's Firearm Academy. Rick Ector and his other instructors provided excellent training and instruction and managed to make a normally dry subject interesting and entertaining. They were patient, knowledgeable, skilled, and talented in communicating important information about gun safety, personal protection, and security. I learned a lot from Rick Ector and his staff. The info is extremely useful to my every day life, as I try to protect myself. I was so impressed with Rick and his staff that I intend to take more courses from Rick's Firearm Academy. I am very lucky to have learned about Rick's Firearm Academy, which should be a must for all Michigan residents. Rick Ector and his staff know their stuff and turned a day of training and instruction on rules - regarding firearm safety and concealed pistol licenses - into an interesting experience that benefited me and my safety. I will take the valuable information they imparted to me into my everyday life as I try to make myself more secure from crime and threats. Well, worth the money. In fact, it's a bargain." "Hello Rick, I just wanted to inform you how insightful your CPL class was. Not only did you and Damian educate me better on the usage of a firearm but you also helped me with being aware of my surroundings and how I am approached by strangers as well. I am in the sales and marketing profession for an aluminum manufacturer. I am often in rural and industrial areas and I am much more comfortable after taking your class. I now have better firearm knowledge, know the difference of taking cover, and have knowledge of when it is illegal to shoot when you have been victimized. I have recommended your class to most of my friends who have an interest; some have handled firearms, but they will find that they too need to take your class. I have every intention to stay in contact for additional training and updates. Thanks again. Regards,"
"Hey! I just wanted to let u know that I really enjoyed your class and since then I've referred a few of my co-workers to participate just this past month and they also enjoyed themselves and learned a whole about carrying a concealed weapon. Expect more of my coworkers to take the class. On behalf of me and Wayne County Roads keep up the Great Work!!! :-))"